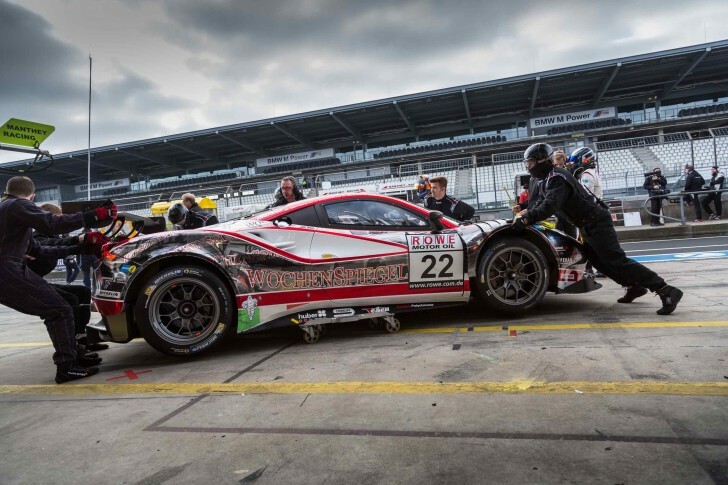 Last Friday, Rinaldi Racing was ready for the second VLN run at the Nürburgring. There, Rinaldi Racing supported the Wochenspiegel Team Monschau. On board the Ferrari 488 GT3 with the starting number 22 and the drivers Oliver Kainz, Jochen Krumbach and Mike Stursberg. Also the Porsche Cayman GT4 with the starting number 169 and the drivers Rene Offermann and Dirk Riebensahm. On Friday two tests took place on the Nürburgring/Nordschleife. So the three drivers could drive some laps on the GT3. Also, the drivers on the Porsche could gain some driving experience. On Saturday morning, Kainz, Krumbach, and Stursberg qualified themselves on the third position in the ProAm class and started the race from position 26 overall. The Cayman with Offermann and Riebensahm reached the fifth place in the SP10 class. The start of the race went well for both cars. Oliver Kainz drove constant lap times in the Ferrari and could move forward until the pit stop. After the pit stop, Mike Stursberg took over the work behind the steering wheel of the Italian race car. After one hour driving time an accident occurred: while overtaking there was a unlucky contact with another car. In full speed, the Ferrari spun and crashed with the front into the barrier. The race was over for the team. It went much better for the Porsche Cayman. Rene Offermann drove the start and until the pit stop, he moved forward until the fourth position in class. Dirk Riebensahm took the last stint and due to a good performance, he reached the third position in the SP10 class.